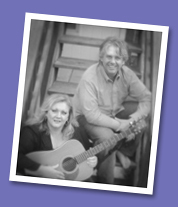 award-winning singer/songwriter siblings, cher & gene klosner, have just completed their fourth cd, stardust, a 2-disc collection of lullabies for all ages. stardust features cher & gene klosnerï¿½s trademark rich, lilting vocals accompanied by the talents of several members of the omaha symphony and omaha conservatory of music, and top shelf jazz players. the original cd art work was created by cherï¿½s husband, emmy award-winning ï¿½the simpsonsï¿½ assistant director and animator, ben lane. the lanes reside in omaha, nebraska, with their seven-year-old son, benjamin, who makes his singing debut on stardust as mommyï¿½s duet partner on ï¿½little sir echo,ï¿½ while gene divides his time between omaha and la. find out more about cher & gene at www.chergene.com.